DREAMer Deportation Case Raises Questions On Trump's Deferred Action Policy : The Two-Way A 23-year-old man says he was deported even though he was given protection under the Deferred Action for Childhood Arrivals program. The attorney general says DACA enrollees "are not being targeted." ICE agents conduct an enforcement operation in Los Angeles in February. A young man brought to the U.S. by his parents and granted protection from deportation under the Deferred Action for Childhood Arrivals program is at the center of a growing controversy about his status and his claims that he was improperly deported to his native Mexico in February. Juan Manuel Montes-Bojorquez is suing the U.S. government, with the assistance of the National Immigration Law Center, for documents explaining why he was deported. "Juan Manuel was funneled across the border without so much as a piece of paper to explain why or how," attorney Nora A. Preciado said. Montes-Bojorquez, 23, is believed to be the first DACA recipient to be deported despite suggestions by President Trump that he would show compassion to the so-called DREAMers and had backed away from campaign promises to end the program initiated under former President Barack Obama. The case has raised questions about the administration's policy toward DACA recipients. Attorney General Jeff Sessions said Wednesday that "DACA enrollees are not being targeted." "I don't know why this individual was picked up," he said. "Everybody in the country illegally is subject to being deported, so people come here and they stay here a few years and somehow they think they are not subject to being deported — well, they are." Established in 2012, DACA covers some 750,000 young people brought to the U.S. as children. It grants them renewable two-year periods to stay, during which time they can study and work if they keep out of trouble. A spokesman for U.S. Citizenship and Immigration Services said there has been no policy change with respect to DACA recipients. "USCIS continues to accept and process both initial DACA grants and renewals under our existing policy," he said. However, the spokesman noted that DACA status could be terminated if an individual were "found to pose a threat to national security or public safety." Montes-Bojorquez' suit says he came to this country when he was 9 years old and had been visiting a friend in Calexico, Calif., in mid-February and walking toward a taxi stand when he was approached by an officer from U.S. Customs and Border Protection who asked him for identification. Montes-Bojorquez said he had left his California identification card and his employment authorization document in a friend's car. Unable to verify that he was covered by DACA, Montes was detained, questioned and asked to sign certain documents. Within three hours he was escorted to the border and left in Mexicali, Mexico. Montes-Bojorquez, who had twice been granted protection from deportation under DACA, filed the lawsuit against U.S. Customs and Border Protection and U.S. Citizenship and Immigration Services. The suit, brought under the Freedom of Information Act, or FOIA, alleges that the government has ignored all requests for information about Montes' deportation. According to the lawsuit, Montes unsuccessfully attempted to re-enter the U.S. a few days later. "Juan Manuel Montes Bojorquez was apprehended by the Calexico Station Border Patrol after illegally entering the U.S. by climbing over the fence in downtown Calexico. He was arrested by BP just minutes after he made his illegal entry and admitted under oath during the arrest interview that he had entered illegally. "His DACA status expired in Aug. 2015 and he was notified at that time. "In addition, he has a conviction for theft for which he received probation." "has no record of encountering Mr. MONTES-Bojorquez in the days before his detention and subsequent arrest for immigration violations on February 19, 2017. There are no records or evidence to support MONTES-Bojorquez's claim that he was detained or taken to the Calexico Port of Entry on February 18, 2017." The statement adds that Montes-Bojorquez never mentioned his DACA status during his arrest interview. It says he "lost his DACA status when he left the United States without advanced parole on an unknown date prior to his arrest by the U.S. Border Patrol on Feb. 19, 2017... departing the country without advanced parole terminates the protections Montes-Bojorquez was granted under DACA." The CBP statement also reverses its earlier claim that Montes-Bojorquez' status expired in Aug. 2015. The agency acknowledged that his DACA status was valid until 2018 as his suit argues. The Montes-Bojorquez case comes amid growing anxiety among DACA recipients. In a February news conference, Trump was asked what he planned to do about DACA. He said, "We're going to show great heart. DACA is a very, very difficult subject for me, I will tell you. To me, it's one of the most difficult subjects I have because you have these incredible kids." But DACA recipients haven't escaped the new administration's crackdown on illegal immigration. In March, 22-year-old Daniela Vargas of Mississippi was detained for two weeks after speaking out in a news conference against her father's detention. 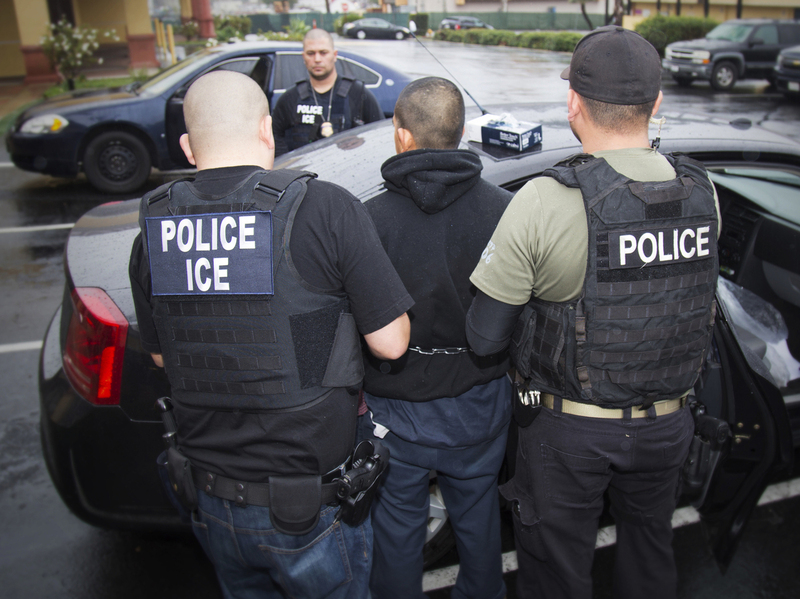 In February, 23-year-old Daniel Ramirez Martinez of Seattle was detained for more than six weeks after he was picked up in a raid that targeted his father. In a March 9 tweet, Immigration and Customs Enforcement said "DACA is not a protected legal status, but active DACA recipients are typically a lower level enforcement priority."